The final pre-season test before the start of the 2018 MotoGP series got underway earlier today in Qatar. Times were tightly bunched with 16th fastest Tito Rabat (Ducati) still less than a second off the quickest pace. That is really saying something given the fact that the Qatar track is long with lap times close to two minutes. 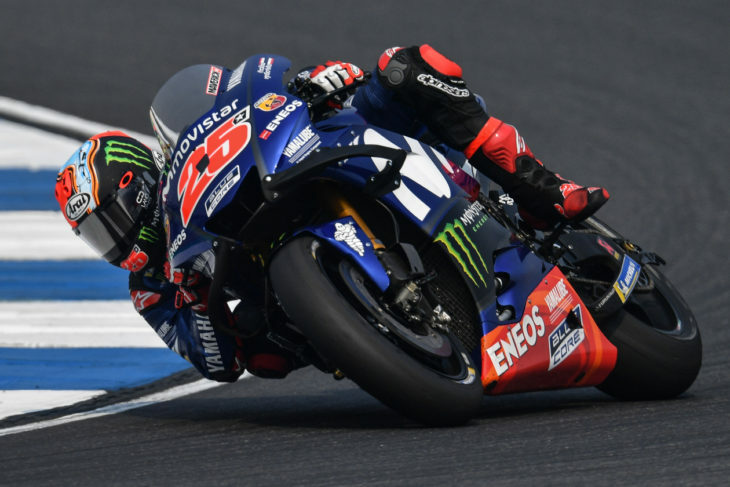 After Day 1, it was Yamaha, Ducati and Suzuki at the top of the time sheets with Maverick Viñales, Andrea Dovizioso and Andrea Iannone, respectively. Johann Zarco slotted into fourth, with Jorge Lorenzo (Ducati) fifth quickest. Two more days of testing will allow the teams to make final adjustments to their engine, chassis and aerodynamics packages before the opening race of the 2018 series at this same track in two-weeks time. We will keep you posted on how the test progresses over the next two days. Here is a link to Day 1 results. Translation: if this was real qualifying MM would have pole with a 1.0S or better lead over #2. That’s a bit aggressive, Marquez is in 6th in Day 2 testing, though I doubt that reflects where he would be in race qualifying. Still a one second lead per lap is unheard of. Zarco is 1/10th of a second off the leader, Dovi. Good point. It’s great to see such a huge, closely bunched lead pack. I’m sure I’ll talk myself into the streaming fee again…….. I will say Suzuki has done a good job in a short time. I wish KTM catches up soon too. I doubt Honda tried that hard today. They have to keep SOME variety otherwise people will draw the conclusion Honda will dominate aaaaagain. Pffft all that worry about Yamaha. 2 Suzukis in the top 6. Suzuki has to be ecstatic with that. Might just be an awesome season again. Unusual that Marquez and Pedrosa are so far down. They have generally been having a great pre-season. It’s Losail. Yamaha pretty much owns this track. They top every test and win every race in Qatar. Neither this test nor the first race here will prove to be much of a harbinger of anything for the rest of the 2018 season.